Hazard management from within the Employers Toolbox online is one of the main features of the Health & Safety module. Once a hazard is identified in your workplace it needs to be recorded in your hazard register, the risks assessed and a management action plan considered and implemented. Unless a hazard can be eliminated or isolated from the workplace t the risks need to be minimised and continually assessed for danger. Depending upon the circumstances and severity of risks surrounding the hazard, management need to determine what a suitable review interval is and the right person to do it. Decide on that and record it in the system. The Toolbox will email you when the next review is due. When reviewing hazards make detailed notes of your observations paying particular reference to the steps, processes and physical measures taken to minimise the dangers. Take photos and upload them. Especially if you make physical changes to the risk management. This demonstrates your ongoing commitment to process improvements in Health and Safety. Particularly hazardous equipment will require ongoing staff training. If safeguards or risk management changes staff will need re-training in this. Schedule this in the system too. Get all training signed off. Scan & upload this against the appropriate staff member records in the system. In the unfortunate event of an accident proof of training is a very strong tool in the employer's defence. 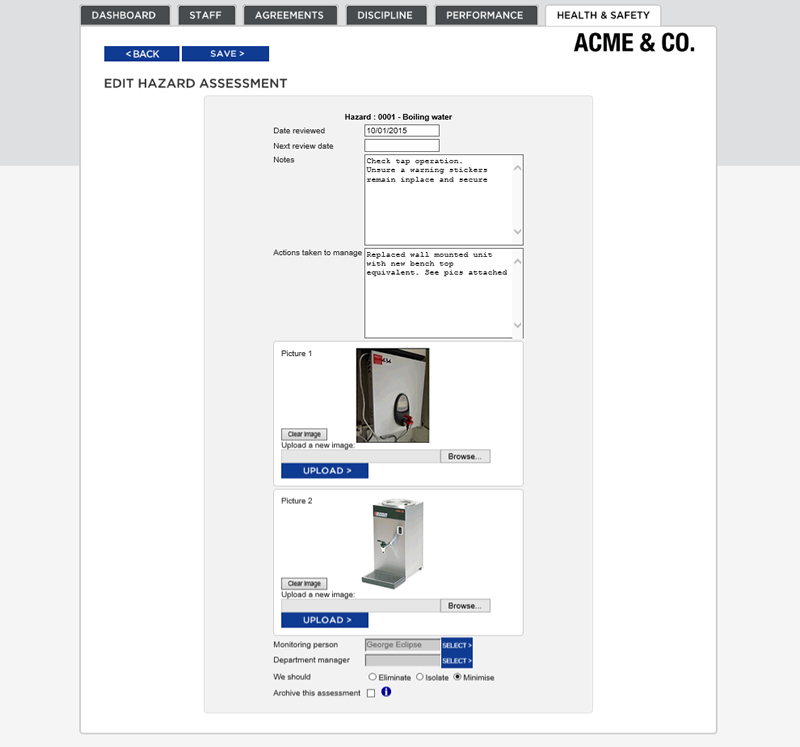 To assist you in doing a risk assessment for machinery use our guidelines provided under the 'Staff training programme' on the homepage of the Health & Safety module. There are a finite number of risks with machinery; mechanical and non-mechanical and it's important not to miss any. Complicated machinery should also have a procedure manual detailing it's safe use. Work Instructions in the system provide a framework for management to train and monitor staff safely in this regard. We will cover this in more detail in another newsletter presently. Since this article was published and subsequent to the new HSWA 2015 this system has been modified to include the latest legislation definitions and management practices. Please read more here.